South Africans are speculating that this man may be the brazen car thief, who stole Rolls-Royce Ghost in Johannesburg on Wednesday. 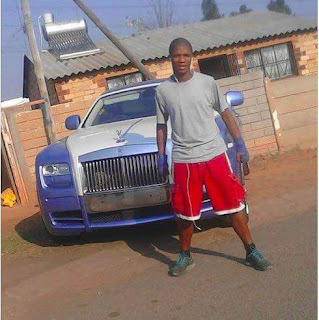 Pictures of a young man posing next to a Rolls-Royce Ghost in Riverlea, southern Joburg, have been circulating on social media. Leranzo Jones decided he looked pretty cool next to these flashy wheels and that people needed to be “reminded” who he is. He’s probably just a resident of the community, who saw the car and decided to take a few snaps next to it, but some are speculating that Jones may in fact be the guy who nicked the car. This is highly unlikely though, as the real perpetrator was running from the cops and abandoned the car in Riverlea. It is believed to be worth R5 million. The stolen Rolls was found abandoned on Wednesday after being stolen from a workshop at The Glen on Wednesday morning, according to the police. Johannesburg Metro spokesperson Edna Mamonyane said in a statement the car was immediately reported stolen. The workshop’s owner apparently spotted it while driving on the N12, and followed it off the N1 South at Golden Highway, where he also alerted two JMPD officers on patrol. After a high-speed chase, the car was found abandoned. No arrests were made after the suspect fled on foot between the houses.